Charlotte 'Lotte' Shadeflower stands around 5 foot 10 inches and is rather waifish with long blackish hair and doe-like eyes. She appears to be around 20 years old and if not a few days younger. Very pleasant on the eyes and does look like she knows a thing or two about this and that that happens behind closed doors. Comes off as rather lost, not in direction or purpose but more of looking for the reason behind it all. Typically, seen with a rapier hung low of her left and an old black velvet glove on her right hand. Charlotte "Lotte" Shadeflower is the daughter of a well-known whore/brothel owner Halanaestra Torynore in Andarr and her father is whoever paid her the most attention and wasn't hitting on her. Rumors have it her blood father is one of three people; a ship captain that goes by Foresteye, a merchant from Crosstreams of the Orme's, or man from Sorraine named Whittemore; but she doesn't care cause they were never around. The one she considers her father is Captain Bartjan of the City Guards and possibly a Grey Dirk. Who taught her how to defend herself with a rapier and that she didn't have to follow in her mother's footsteps if she didn't want too. In her free time after she was done washing bedding and clothing or cleaning up the main floor, she was in the basement of brothel hunting down rats and skewering them or shadow sparing with a bag of flour as her target. Till she was of proper age to join the other women in ply the art of seduction and pleasure when not training with her blade. One day she broke the cardinal rule of the brothel and forgot her rapier was in her belt. Not thinking and reacting as her bum was slapped. She spun about while drawing the blade and ran a man through. Taken off in chains and tossed in jail to await hanging. In the dead of night, Captain Bartjan came in and opened her cell and smuggled her to the docks and on to a ship bound for Mikona. He told her never come back and gave her a small sack of coin. Of the many kinds of whores in Andarr; Lotte was a harlot. Like her mother and grandmother even; possible further back and that. In Andarr, like Stalwart (City of Pleasure) some forms and ways of prostitution are not only seen as need employment but even respectful employment. That is to say, she worked in well kept and honestly ran, respectable brothel named 'Madam Torynore's Emporium of Fine Delicacies, Treats, and the Exotic' which her mother owned and operated. She wasn't on the streets or working the alleyways like the hustlers, painted boys, or the trollops. 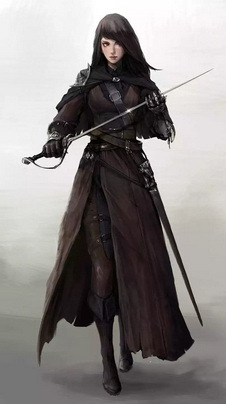 Nor was she working the various inns of Andarr like a 'red lady' or 'fancy girl' looking to get by or possibly more if they wanted to change location. All brothels had gimmicks. Madam Torynore's Emporium of Fine Delicacies, Treats, and the Exotic was no different. Always in a dress or gown that was picked out for them by Madam Torynore herself. All the women dressed there dressed they very and were versed in the affairs of the day or matters of life. Down the way was the 'The Bards and the Bees' where all the girls dressed as boys and the boys were painted up like girls. Then the 'The Layflower' at the end of way is where the girls wore nothing at all. At all the brothels, the local healers were always welcome and would proclaim the 'house' and its 'staff' clean with a mark on the door. Harlots like Lotte, Maddy, and others that worked in brothels could easily get in upwards of 1,000 coins for their 'time' per guest. As they are all about seduction and pleasure; quality over quantity. Where your trollop is lucky to get more than a few coins for whatever act was performed in an alleyway or the 'fancy girls' looking for just a bit more or her room billed paid. Lotte and Maddy did dream over being courtesans but neither of them had the beauty of the grace to achieve such. After meeting a few courtesans decided that was to much work and preparations they do and all for one person. But they were very envious of how courtesans are adored by their one person. She writes her truest friend Madlen 'Maddy' Lammers back in Andarr at Madam Torynore's Emporium of Fine Delicacies, Treats, and the Exotic but never sends them. She writes to her friend of the world she sees and hears about. Like Lotte, Maddy is harlot by trade and they have never seen the world. Only heard about from those that paid for their pleasure. Stories they never really believed but as Lotte is learning are very true. Captain Bartjan; City Garud, lover of Halananaestra, and fatherly figured to Charlotte. Alessandra Strommen; cheat at cards. Marianne; taught Lotte and Madlen the arts. Remy, also known as Remi; a painted boy. This page was last edited on 24 January 2019, at 06:34.